Fig. 1. 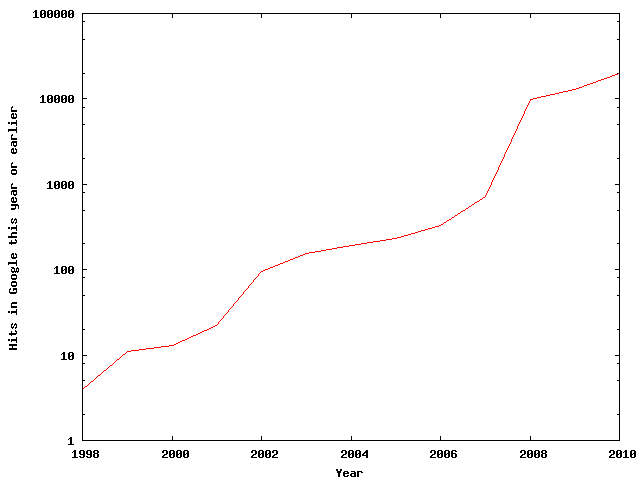 The usage of the term semantic drift in web documents. Note the logarithmic scale on the Y-axis: There is a tenfold increase between 2007 and 2008. By the first of January 2010 there had appeared 19600. These use of the term in the context of semantic web is not very common. For instance, semantic drift and semantic web 827 hits whereas the latter on its own yields more than three millions hits. The increase in popularity occurs in bursts. It seems to me that the term get a new meaning in each burst, but I've only looked at a small number of texts. You hear a term, and you may think that it sounds cool and therefore you import it into your active vocabulary. About ten or twelve years ago semantic drift was such a term for me. Semantic change, also known as semantic shift or semantic progression describes the evolution of word usage (Wikipedia). I'm an evolutionary biologist by training, for me genetic drift and evolution through natural (Darwinian) selection have two different meanings -- drift is the evolution which is due to random change which arise, mainly but not exclusively, through mutation between synonymous genes -- they differ but the effect is the same. I used the term semantic drift publicly year 2000. I used it for a couple of years, but I don't think I've used it since 2003. The term has since then gained some popularity in many communities (see Fig. 1). From what I've found out, the term first appeared in a metadata or semantic web context in an article by Stuart Weibel 1995. Fig. 2. The so-called dumb down principle. The only way to cope with the semantic diversity. The discussion I adhere to above (the hitherto only documented occation where I mention semantic drift) was on w3.org's RDF mailing list, and was about the meaning of the metadata element title. More precisely, we were discussing what it meant that the DC title changed name space URI between version 1.0 (http://purl.org/dc/elements/1.0/title) and version 1.1, (i.e., http://purl.org/dc/elements/1.1/title)? There was a reader of DCMI documents who didn't understand why we did that change. In retrospect I think we didn't understand that either ourselves. We had made a mistake and we couldn't really acknowledge that. This is the history behind the version number 1.1 in DC. At the time I presented a study of meta-tags in around 5 million HTML documents during my life as search engineer 1996-2000. This was the time when I felt the need for Fig. 2. I drew it for illustrating what I was doing when I was handling metadata. The reason for using dumb down is that even if your service you're building is equipped with an advanced search form, you won't be able to sell it to a customer who claim that usability is important if it contains more than around ten fields. I have recently been thinking about these issues, frightened by dbpedia.org's vocabularies. See for instance August Strindberg's entry. Inferno is one of his works. From what I can tell, dbpedia.org is mainly using their own vocabularies, and foaf. I cannot find dc:creator as a property of Inferno, instead they use dbpedia-owl:author. I hope they had a nice time defining their ontologies. I, however, feel that I need my funnel (Fig. 2) more than ever. This entry (The proliferation of redundant meaning) within Sigfrid Lundberg's Stuff, by Sigfrid Lundberg is licensed under a Creative Commons Attribution-ShareAlike 3.0 Unported License.